Business cards are the seeds that grow a good business. When you don’t have them, you are missing valuable opportunities to spread your name, brand or service. 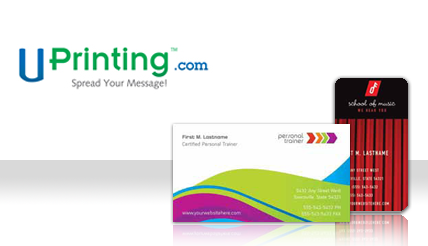 That’s why I am very happy to announce this giveaway, 500 absolutely free business cards from UPrinting.com! I’m also happy to be receiving 500 for myself as the giveaway host 😉 How’s that for full disclosure, FTC? Leave a comment telling me how you will use the business cards. Will they be for your blog or your freelance tax consulting firm? Or will they be for your pressure wash mailbox cleaning service? Whatever it may be, UPrinting and I would really like to know! The giveaway will run from today, April 23 till midnight, April 26th. One lucky winner will be randomly drawn and announced. The giveaway is limited to United States residents, 18 years old and up. p.s. I won’t comment on giveaways cos I want to keep things nice and neat but I do read all the comments! My husband and I would use these cards as contact cards for our freelance endeavors. I will use these cards as a contact point for my blog. .-= Zach @College for 10k´s last blog ..Yakezie Round-Up #5 =-. I would use them to create a contact card for myself. .-= Beating Broke´s last blog ..Murphy Strikes Again =-. I would give them to my mother, who’s looking to give piano lessons in her home. .-= ChrisFM´s last blog ..360 Degrees of Finance: Inaugural Edition =-. I will be using the cards for a science tutoring business that I am establishing within the next 2 weeks. .-= Damilola´s last blog ..Please, Interrupt Me =-. I would use the cards for my Tax Consulting and Financial Planning business. Also, would direct people to my blog. .-= Khaleef @ KNS Financial´s last blog ..Last Minute Tax Advice From KNS Financial – A list of our most read tax articles this year =-. We would use these cards to give away at Pet Adoption events, to raise awareness about the wonderful pets available from our county Animal Control Adoption Center! I will be using those business cards to network. My goal is to land a job in television post production. What a great giveway! I would have used these 15 years ago when I had a side business in computer programming. I have a blog, but I’m so new I’m not sure what I’d use them for yet! Great idea though, too cool! I will use the cards for my speaking business. .-= Dr Dean´s last blog ..Spending Urges: I Don’t Have No Stinkin Spending Urges!!! =-. I will use them as contact cards, as it’s time for me to start networking. I’m aiming for a job in marketing. I’d use the cards while freelance writing. I will be using the cards for a science tutoring business that I am establishing within the next 4 OR 5 weeks. I would give these out as contacts to people in twelve steps groups I belong to, so they can get ahold of me when they need me. Day or night. Hey Jesse, thanks for stopping by my site and your kind comments. Btw- I like your WP template! Also, I’m pissed I got to your site a day late (I was on vacation) cause I could really use a new set of bcards! .-= Car Negotiation Coach´s last blog ..10 expensive car negotiating mistakes =-. No problemo Coach, and thanks, I designed my site myself. I’m sorry I didn’t spread the word better about my contest, I should have posted in the Yakezie group about it, sorry about that 🙂 I’m a UPrinting affiliate so I’ll have another giveaway from them in upcoming months, I’ll be sure to alert everyone to it in the group. Car Negotiation Coach on Is Auto Assure a Scam? Car Negotiation Coach on Amazon Prime Review – Is It For You?